For today’s Destination of the Week, TPG Contributor Casey Hatfield-Chiotti takes us to her hometown of San Diego, also sometimes known as “America’s Finest City” (despite what happens in mayoral politics!) thanks to gorgeous weather, a beautiful downtown, great museums and a buzzing food scene. Many regard San Diego as the “surfer dude” of cities, pretty on the outside but not much happening on the inside. It’s true San Diego is known for surfing and sunny weather (average daily temps are 70.5 degrees Fahrenheit), however, thanks to an influx of young creative types, the city’s eclectic neighborhoods are absolutely exploding with art galleries, breweries, and farm to tables restaurants. Chefs from around the country are choosing San Diego because of its year-round growing season. Public and private investment has helped turn the once gritty Gaslamp District into a thriving center for dining and nightlife. Major revitalization efforts are spreading west to the somewhat kitschy Waterfront and to the East Village where the city’s $185 million Central Library will open at the end of September. Turns out, this sunny city is more than just a pretty face. 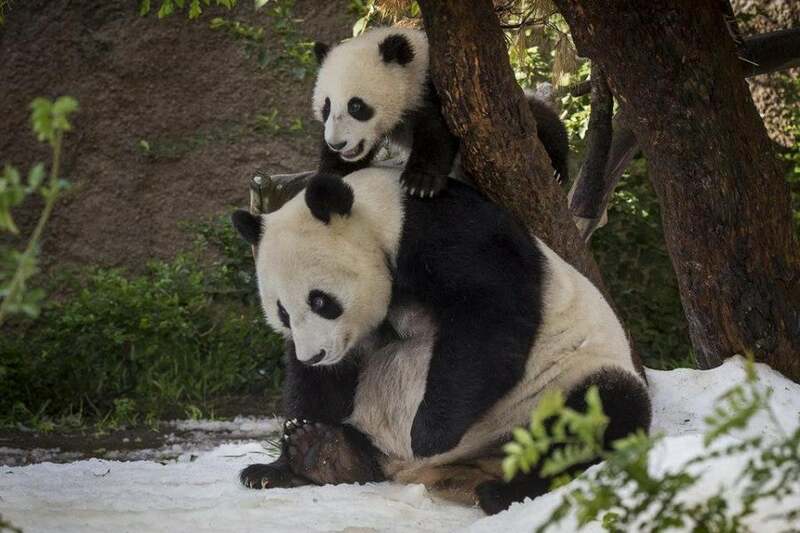 Be sure to stop by the world-famous San Diego Zoo. 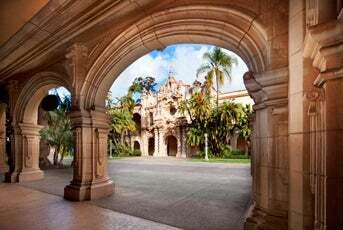 In addition to its 70 miles of pristine coastline San Diego’s best asset many be 1200-acre Balboa Park. The urban park was built for the World’s Fair in 1915 and is the city’s center for arts and culture. The park boasts manicured gardens, 15 museums and the world-famous San Diego Zoo. Balboa Park was built for the World Fair in 1915. To experience another beautiful public space and a bit of history, visitors should head to Presidio Park, the site of San Diego’s first fort and mission established in 1769. None of the original buildings still stand but it’s now a beautiful public park with sweeping views of the city and a Mission-style museum that houses the San Diego History Center’s collection. The USS Midway is now a maritime museum. The military, which started establishing a presence in San Diego in the mid to late 1800’s due to its strategic location on the Pacific Ocean, is an important part of San Diego’s history. 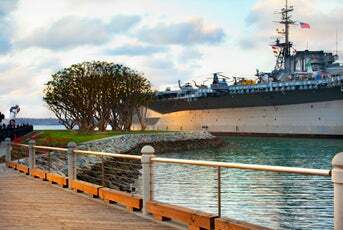 The longest serving Naval aircraft carrier of the 20th century, the USS Midway is now a maritime museum and can be visited in the San Diego Harbor. The Naval Training Center operated in Point Loma from the 1920’s to the 1990’s. The historic site is now a mixed-use development called Liberty Station and is filled with restaurants, art galleries and shopping. In the summer San Diegans put on their finest and head North to the racetrack in the upscale beach community of Del Mar. The historic Del Mar Racetrack, co-founded by Big Crosby, has horse races from July through September. The racetrack has announced it will host two horse-racing seasons next year, one in the summer and one in the fall. 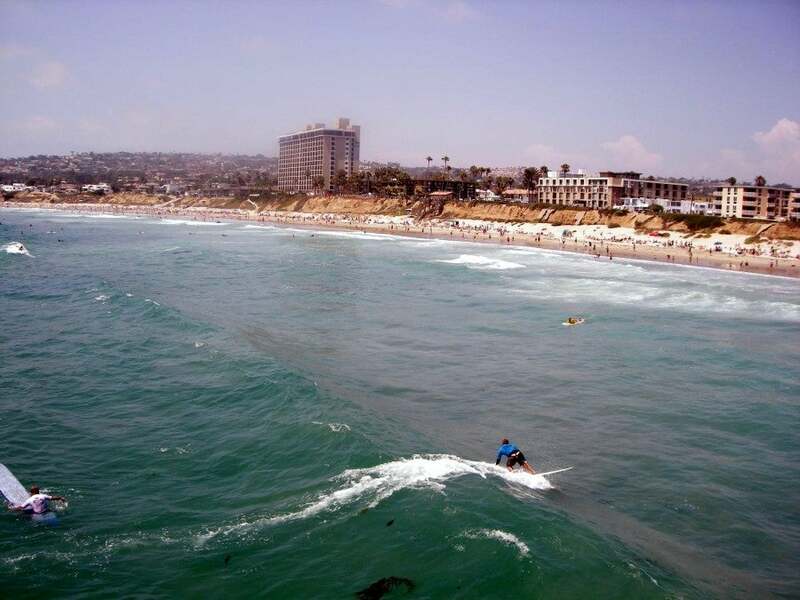 Surfing is a popular San Diego pastime. Beginners should head to Tourmaline in Pacific Beach for mellow waves and ample parking. The communities of Mission Beach, Ocean Beach and Coronado are all worth a visit if you want to stroll along a boardwalk or splash in the ocean. San Diego has also become a mecca for craft brew. One of the brewery’s that put San Diego on the map, Stone Brewing recently opened a 10-barrel brewhouse in historic Liberty Station. The site also includes a restaurant, bocce ball court and landscaped gardens. Ballast Point Brewing is worth a visit to try their award winning Sculpin IPA or to sample spirits like gin and rum. Thorn Street Brewery in North Park makes creative brews laced with ingredients like honey and orange peel. Boutique beer shop, Bottlecraft has locations in Little Italy and North Park and specializes in unique beers from all over the world, as well as San Diego. Beer bars like Tiger Tiger and Hamilton’s sell a variety of local brews on tap. Celebrity Chef Brian Malarkey’s comfort food eatery, Searsucker. Not far from the airport, San Diego’s Little Italy neighborhood offers a variety of dining options. The main drag, India Street, is lined with run-of-the-mill Italian restaurants, but look a little deeper to find some of the city’s best eats like upscale Milan-inspired restaurant Bencotto and its sister eatery Monello, which specializes in Italian-style street food. Just down the street, hipsters line up at Japanese ramen bar Underbelly, and Prep Kitchen serves a fresh seasonal menu with dishes like roasted pork belly with pickled rhubarb as well as Spanish tapas. Many of the restaurants in the Gaslamp tend towards touristy but Celebrity Chef Brian Malarkey’s comfort food eatery Searsucker makes delicious dishes that back up the buzz like whiskey-braised pork with grilled peaches. Head to some of San Diego’s outer boroughs for more quaint neighborhood restaurants like South Park’s Buona Forchetta an authentic Neapolitan style pizza place. In Kensington Heights, Fish Public is the seafood restaurant San Diego has been missing—simple but well executed dishes like charred octopus with romesco served in a lively atmosphere. For San Diego’s favorite dish, the fish taco, head to South Beach Bar and Grill in Ocean Beach for tacos and tostadas piled high with fresh mahi-mahi. Southwest Airlines has the largest presence in San Diego. The San Diego International Airport is the busiest single-runway commercial service airport in the nation, operating 600 nonstop and connecting flights daily. 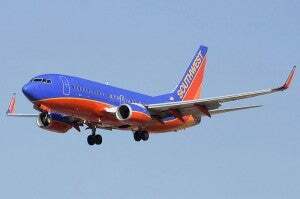 Southwest Airlines is SAN’s largest carrier, but Alaska Airlines has been increasing nonstop service to and from San Diego, and American Airlines, Delta, United, Virgin America, US Airways and JetBlue offer frequent flights. The airport is undergoing an expansion and improvement project called the Green Build. Ten new gates have been added to Terminal 2, and a concessions area that will showcase local gourmet food vendors is scheduled to open this month. Located just 3 miles from downtown, getting from the airport to most locations within the city is easy. Seven shuttle companies offer service to and from the airport. The Route 992 Bus operates between the airport and downtown. To catch a taxi follow signs to the Transportation Plaza. All the major car rental companies are represented. Unfortunately there are no Club Carlson properties in downtown San Diego. There is a Country Inn & Suites in Sorrento Valley near the beach community of La Jolla and a Radisson Hotel in Rancho Bernardo. Lobby area at the Hilton San Diego Bayfront. Hilton San Diego Bayfront: Located right on the waterfront, rooms at this 30-story hotel offer spectacular views of the San Diego bay and Coronado Island. The hotel is also home to the only heated saltwater infinity pool in the city and the recently renovated open-air poolside bar and lounge is the perfect place to enjoy tropical inspired drinks and small bites like Pineapple Mojitos and shrimp and mango ceviche. Rooms feature clean modern lines and a sea inspired color palette. The hotel’s Spa, Spa Aquazul, offers treatments like bubbling mud wraps and natural seaweed soaks. With nearly 1200 rooms, this hotel feels a bit like a mini city with 6 eateries including a Starbucks and Sweet Things Frozen Yogurt. This is Category 7 property and requires 40,000 HHonors points (30,000-60,000 seasonally) for a free night. Room rates start at $169 in August. King guest room at the Hilton San Diego Resort & Spa, Mission Bay. Hilton San Diego Resort & Spa, Mission Bay: This 50-year-old resort sits on 18 lush acres overlooking Mission Bay. Each of the 357 rooms offers bright colors, luxury linens and designer furniture. With elegant archways and tiled roofs the architecture is California Coastal meets Spanish Colonial. The central location 6 miles from the airport is close to Balboa Park, Historic Old Town, and SeaWorld. The resort also offers a variety of seasonal activities like poolside movies and hosted S’mores. Extended patio guestroom come with the added perk of outdoor fire pits. This is Category 7 property and requires 60,000 HHonors points (30,000-60,000 seasonally) for an award night. Room rates in August start at $199. 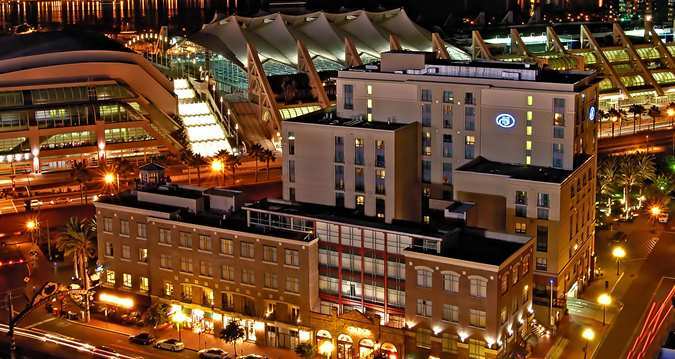 Overview of the Hilton San Diego Gaslamp Quarter. 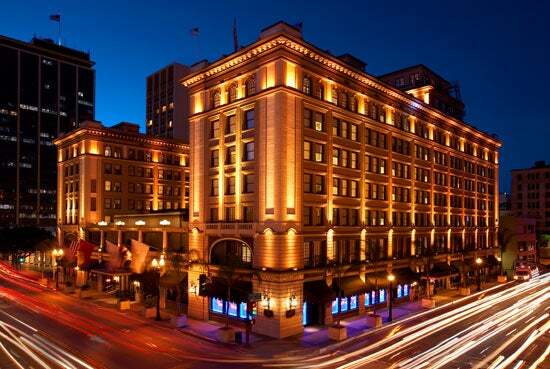 Hilton San Diego Gaslamp Quarter: This urban hotel lies smack in the middle of San Diego’s center for dining and nightlife the historic Gaslamp Quarter and is also the closest hotel to the San Diego Convention Center. Rooms feature contemporary furnishings and pops of color like a bright orange wall or sunny yellow pillows. For those who really want exclusivity, the Lofts on 5th Ave. at the Hilton is a “hotel within a hotel” and offer loft-style living with 14-foot tall ceilings, and whirlpool tubs. Guests can also enjoy an outdoor fire pit perfect for pre or post Gaslamp cocktails and free WiFi. Rooms start at $299 in August. This is Category 7 property and requires 50,000 HHonors points (30,000-60,000 seasonally) for an award night. 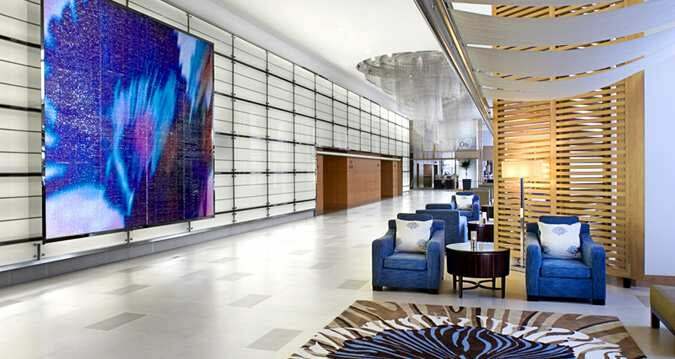 Other Hilton properties include Hilton San Diego Mission Valley, DoubleTree by Hilton San Diego Downtown, Embassy Suites San Diego Bay – Downtown, and the Hilton San Diego Airport. Rooftop pool at the Andaz San Diego. 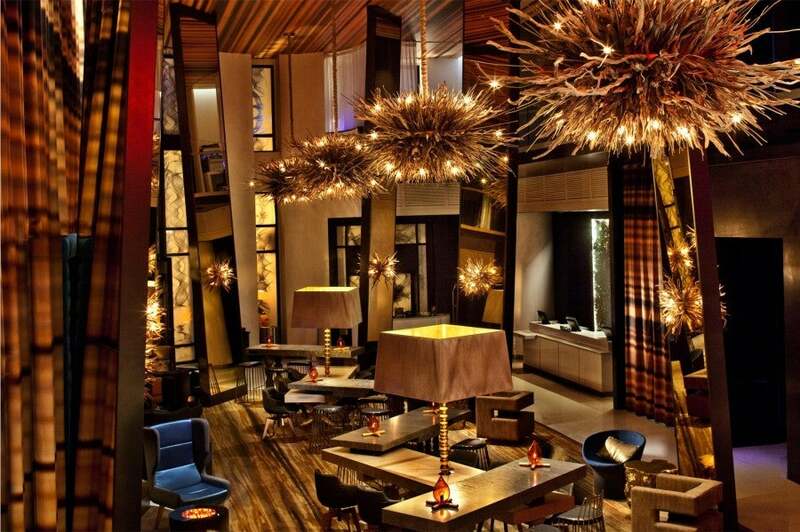 Andaz San Diego: This 5-star boutique hotel is a chic haven in downtown. The roof deck (the largest in San Diego) includes a pool, outdoor dining, fire pits and sweeping city views. Rooms feature sleek contemporary designs including rich woods and leather furniture, as well as free WiFi. Foodies take note, Philippe Starck-designed Japanese restaurant Katsuya is adjacent to the lobby. Rates in August start at $179. 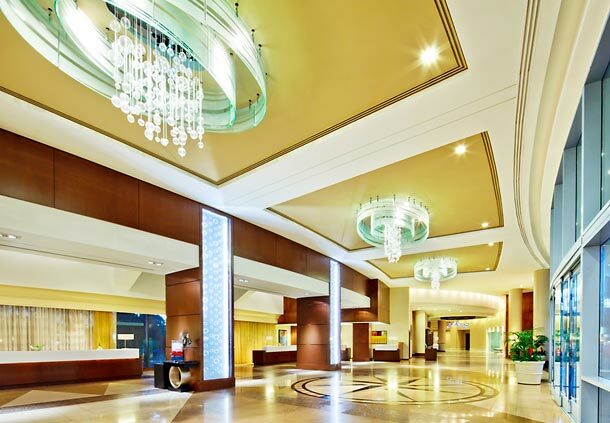 As a Category 5 property, award nights are available for 18,000 Hyatt Gold Passport points. Overview of the Manchester Grand Hyatt. Manchester Grand Hyatt: At 40 stories tall, this San Diego landmark, comprised of two towers, is SoCal’s largest hotel, with over 1,600 rooms, and amenities include two rooftop pools, and a full service spa and salon. 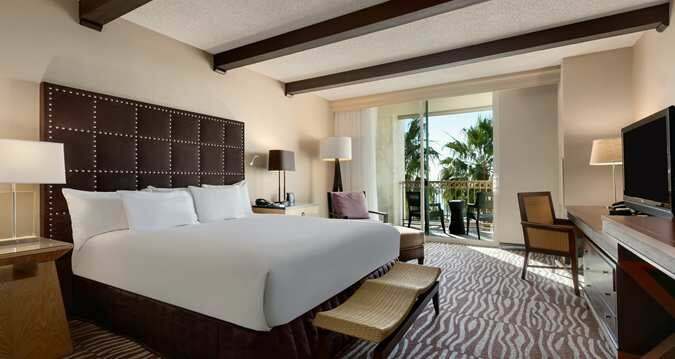 Guestrooms recently went through a redesign and boast floor-to-ceiling windows and California coastal-inspired décor. The geometric carpet pattern echoes the lines of the Coronado Bridge and the custom artwork is abstract images of local beaches. The Top of the Hyatt cocktail bar offers one of the best views in the city. Snag a spot at sunset and enjoy signature cocktails like a classic dry martini. This is a Category 5 property and requires 18,000 Hyatt Gold Passport Points for a free night’s stay. Rooms start at $219 in August. Hyatt has two other properties in San Diego including the Hyatt Regency Aventine in La Jolla and the Hyatt Regency Mission Bay Spa and Marina. King guest room at the Hotel Indigo. The Hotel Indigo: This 215-room LEED-certified boutique hotel in the heart of downtown features eco-chic decor and a rooftop bar overlooking PETCO Park. 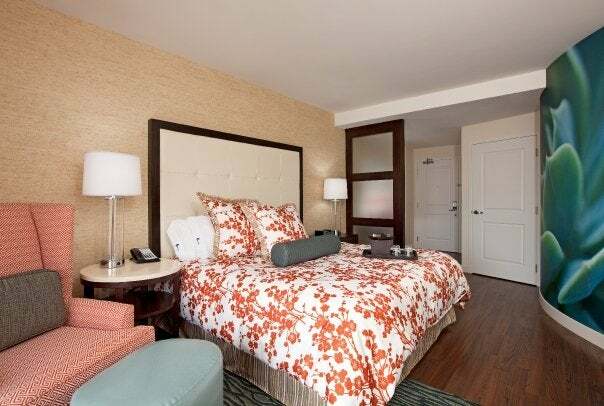 Guest rooms are both contemporary and whimsical with floral beds spreads, hardwood floors and spa-inspired showers. The hotel’s restaurant, Table 509, offers healthy salads as well as more decadent fare like challah French toast. WiFi is complimentary and with no fees of any kind for pooches, it’s one of the most pet-friendly hotels around. Rooms start at $152 per night in August and require 40,000 IHG Rewards Club points for a free-night redemption. The Holiday Inn Express by SeaWorld is another IHG Rewards Club property. Pool area at The Hotel Solamar. The Hotel Solamar: This boutique hotel in the Gaslamp Quarter goes the extra mile to make guests feel welcome including a daily hosted “So-Cal Hour” in the lobby where guests can enjoy local micro brews or specialty drinks like sangria. The property’s 235 rooms include tan, leather-like stitched walls, dark mahogany furnishings and overstuffed chairs. To truly relax, head to the rooftop pool terrace, which provides cool city views, private cabanas and a cocktail bar that serves savory seasonal bites and fruity drinks like a chili-mango margarita. Many of the dishes served at the hotel’s seasonal American restaurant Jsix include herb’s grown on the hotel’s rooftop terrace. Kimpton has its own loyalty program called InTouch. Free nights can be earned by booking directly with Kimpton and WiFi is free for InTouch Guest Loyalty members. Rooms from $195 in August. The Hotel Palomar is also a Kimpton Property. Lobby area at the San Diego Marriott Marquis & Marina. San Diego Marriott Marquis & Marina: This waterfront hotel is a great choice for boat lovers with its 446-slip marina, boat rentals and variety of water activities. Recently redesigned guestrooms are split between two 25-story towers and include contemporary décor, and a nautical-inspired color scheme. The lush, tropical pool setting includes towering palm trees, and two meandering outdoor pools. The hotel also has four restaurants including a Roy’s Asian Fusion. This is a Category 7 property and requires 35,000 points for an award night redemption. Rooms start at $199 in August. 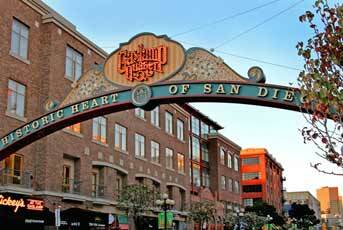 The Marriott Gaslamp Quart is located in the historic Gaslamp Quarter. 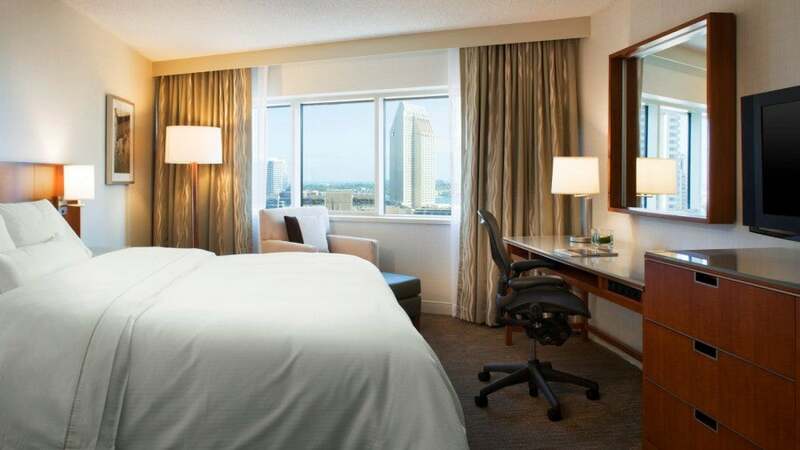 San Diego Marriott Gaslamp Quarter: This centrally located hotel features chic contemporary décor, butter-soft 300 thread count linens and pillow-top mattresses. The restaurant Soleil @k serves Napa Valley-inspired food and wine and the rooftop Altitude Sky Lounge offers a birds eye view of PETCO Park. WiFi is complimentary in the lobby and public areas. Room rates in August start at $199. This is a Category 7 property and requires 35,000 points for an award night. Patio and resort boat dock at the Coronado Island Marriott Resort & Spa. 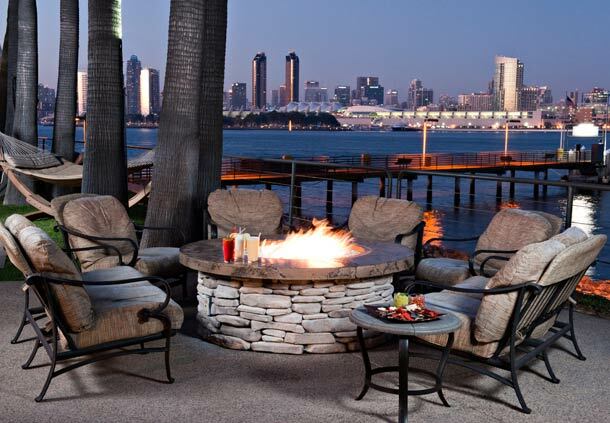 Coronado Island Marriott Resort & Spa: Located on 16 waterfront acres in Coronado, this 310-room resort features stunning views of downtown and the San Diego Bay. An open, airy lobby greets guests and the décor is cool and calming with neutral tones and natural wood elements. The property also offers an intimate spa, three heated pools, and tennis courts. Guests can even take a water-taxi to downtown from the dock just steps from the resort. WiFi is complimentary in the lobby and public areas. This is a Category 7 property and requires 35,000 points for an award night. Rooms start at $299 in August. 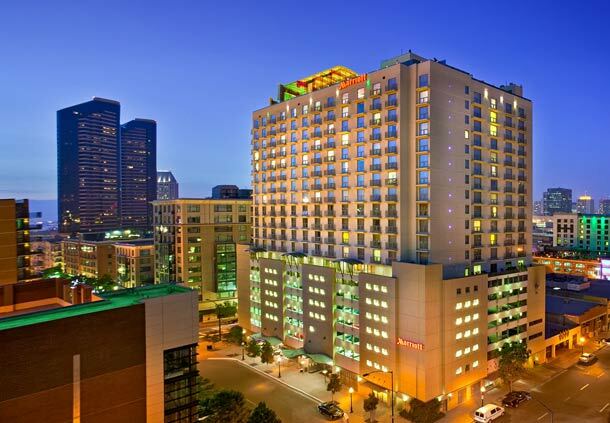 Other Marriott properties include the Courtyard San Diego Downtown, and the Residence Inn in the Gaslamp Quarter. Lobby area at the W San Diego. W San Diego: This sleek hotel just went through a $5-million dollar redesign resulting in fresh updates to the lobby and rooftop bar. The plush Living Room lobby has a full bar and celebrity art installations. The Rooftop features a playful stacked beach chair sculpture that also acts as a bonfire and is the perfect place to sip on a pitcher of Thai basil sangria while the sun goes down. The hotels 258 ocean-hued guest rooms have window seats, 350-threadcount linens and views of the San Diego skyline. The hotel’s restaurant Kelvin is contemporary world cuisine with Latin flair. This is a Category 4 property and requires 10,000 Starpoints per award night. Rooms start at $199 in August. King guest room at the Westin San Diego. 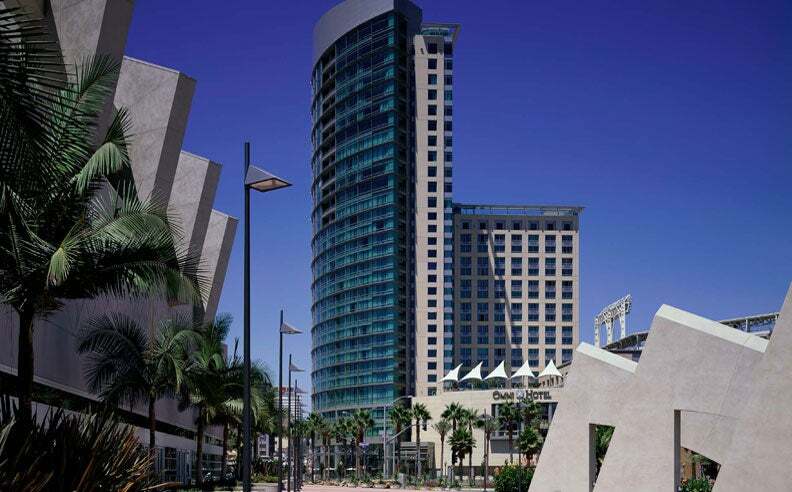 The Westin San Diego: This centrally located hotel is walking distance to many of San Diego’s famed attractions including The Convention Center, the Gaslamp Quarter and the waterfront. Rooms feature simple décor with modern wooden headboard beds and stark white linens. The 436-room hotel also offers a heated outdoor pool, complimentary airport shuttle service and free WiFi. Insider tip, the lobby bar has great daily happy hour specials like half off bottles of wine on Thursday. Prepaid room rates are as low as $145 in August. This is a Category 4 property and requires 10,000 Starpoints for an award redemption. Other Starwood properties include The Sheraton San Diego Hotel and Marina, The U.S. Grant, and The Westin Gaslamp Quarter. Fine Hotels & Resorts is a loyalty program for The Platinum Card from American Express cardholders who receive special benefits at participating hotels such as early check-in and late check-out, complimentary breakfast, room upgrades, and other perks. Exterior of the US Grant. The U.S. Grant: This palatial 100-year old hotel remains one of San Diego’s most luxurious addresses. The son of Ulysses S. Grant built the hotel in 1910 in honor of his late father. It’s on the national register of historic places and includes original features like arcadia windows and an elegant white marble staircase. Luckily, thanks to recent renovations, the hotel doesn’t feel the least bit dated. The property’s 270 guest rooms are a unique blend of classic and contemporary and feature 9-foot tall ceilings with crown molding, Empire-style furnishings and contemporary Yves Clement drip-painting headboards. The U.S. Grant also has a $6.5-million dollar art collection including work from European, American and Native American artists and the art deco-influenced Grant Grill Lounge makes some of the city’s best cocktails like a Manhattan that is aged in oak for 100 days. Complimentary WiFi is available in the lobby. Rates from $199 in August. When cardholders use a Visa Signature credit card to book a room through the Visa Signature Hotels program, they are eligible to receive extra perks such as discounted room rates, room upgrades, free breakfast, early check-in and late check-out, dining and spa credits and more. Visa Signature cards include the Chase Sapphire Preferred, Chase Sapphire, British Airways Visa Signature Card, the Hyatt card, the Marriott Rewards Premier Credit Card and Marriott Rewards cards, the Southwest Rapid Rewards Plus card, Bank of America’s Alaska Airlines Visa Signature credit card and Hawaiian Airlines cards, Capital One Venture Rewards Credit Card, Citi Hilton HHonors and Citi Hilton HHonors Reserve, US Bank FlexPerks, Citi AAdvantage Visa Signature, and many more, so chances are you’re carrying at least one of them in your wallet. Stanza Vista room at The Keating. The Keating: Designed by the team behind Maserati and Ferrari, this 35-room hotel in the Gaslamp Quarter is an interesting hybrid of historic architecture and Italian-inspired design. The building itself was constructed in the 1890’s and rooms like the chic Loft Suites still have original features like brick walls and bay windows. The décor feels like the inside of an Italian sports car and includes mod furniture like doubled sided red and white chairs, rich hardwoods and stainless steel accents. Rooms also boast Frette Egyptian cotton sheets and Lavazza espresso machines and a variety of spa treatments are offered including deep tissue massages and organic coconut sugar scrubs. WiFi is complimentary for guests. Rooms from $197 in August. Other Visa Signature properties include La Valencia, The Andaz and The US Grant. Exterior of the The Omni Hotel San Diego. 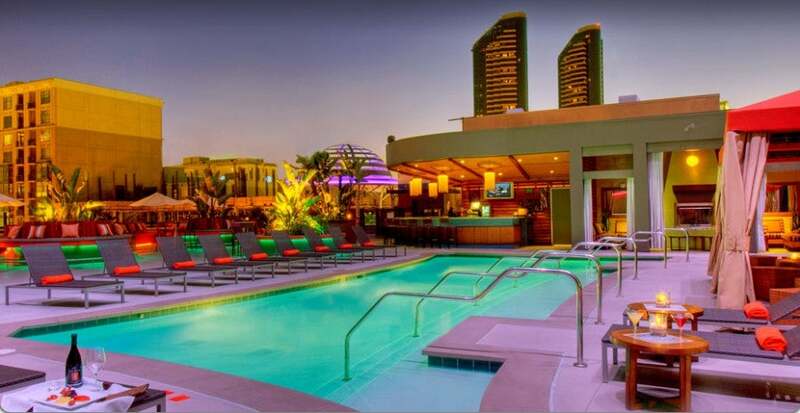 The Omni Hotel: This 511-room hotel is connected to PETCO Park via pedestrian sky bridge and also features an outdoor terrace with stone fireplace and a heated pool. Rooms offer 360 square feet of living space as well as floor to ceiling windows and a neutral color palette with warm wood accents. The hotel’s loyalty program is called Select Guest and members receive free WiFi. Rooms in August start at $169.15 thanks to a 15% summer discount. 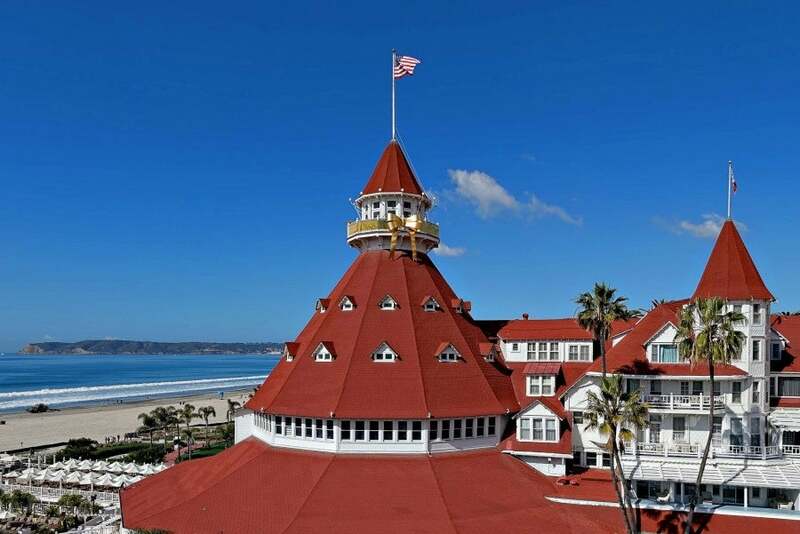 Hotel Del Coronado: With its iconic red turrets and white wooden siding, this Victorian-era hotel is a true San Diego landmark and was the largest hotel in the world when it opened in 1888. It’s hosted countless celebrities over the years from Kirk Douglas to President Jimmy Carter and even had a starring role in the classic screwball comedy, Some Like it Hot, starring Tony Curtis, Jack Lemmon and Marilyn Monroe. Today the 680-room property offers a range of accommodations from 200-square-foot Victorian guestrooms to luxurious three-bedroom villas. Rooms all feature elegant beach bungalow-inspired décor with white shutters and calming colors like gray and butter yellow. Dining options include a beachfront restaurant, a pizza and wine bar and the world famous Sunday brunch in the beautiful Victorian Crown Room. Rooms from $330 in August.